Abstract: Quando viajei até Quissamã (Brasil), para conhecer um fado vindo do tempo dos escravos, fiquei intrigado com o que descobri. Por um lado, entre os fadistas circula a crença de que o fado é de Deus, vá-se lá saber porquê. Por outro lado, o fado de Deus é dançado e sapateado, em jeito afandangado, quando é sabido que o fandango batido foi das danças mais perseguidas no Brasil colonial pela sua má reputação. Na tentativa de decifração destes enigmas exploro trânsitos do fado e do fandango num enredo de disseminações, transformações, variantes e recomposições. O que descobri foi que os nós desse enredo se atam e desatam nos cronotopos desses trânsitos. Abstract: “Political community” and “transnational citizenship” are two of the greatest categories that lead the debates in the field of transnational studies, more specifically in the analysis related to the political practices of the transmigrants regarding the expansion or the exercise of the civic and political rights outside their native countries. From an ethnographic perspective, this article analyzes the existing tensions between both categories. In order to achieve this, it summarizes some of the current debates in literature and mentions the approaches that allow us to think of their uses, meanings and specific practices. In order to point out, if not the autonomy of both concepts, at least the heterogeneous and complex aspect of their practical articulation, we recur to one of the oldest migration processes in the Southern Cone: that of Uruguayans to Argentina. Abstract: This article supports the argument that the researches on transnationalism and cultural studies had moments of confrontation and that, in these discussions, they influenced each other positively. I will try to expose this relationship from my own anthropological experience. The work concludes with a concern about the way in which the emergence of transnational actors is forming part of a new hegemonic formula for the functioning of political economy. Therefore, I will argue that the discussion in the researches on transnationalism and on the cultural studies should help to build a critical theory of the current moment, for which I propose five lines of work. Abstract: The article analyzes the change of perspectives and narratives about national borders, the circulation of people and the political definitions of the limits of the National State in the social sciences since the fall of the Berlin Wall, in 1989, to the most recent outcomes of the international geopolitics. The place occupied by the transnational perspective of migration is questioned, inquiring its role in the formation of critical anthropological reflections that, in the last two decades, have allowed a re-oxygenation of the classical categories of analysis in the social sciences. The discussion also sediments the questioning about the possible outcomes of this anthropological reflection in a context of profound international political changes regarding human mobility. Abstract: Jóvenes de sectores medios-altos y altos de Buenos Aires practican rugby y realizan prácticas educativas solidarias, en un contexto de crecimiento de las desigualdades y heterogeneización de las elites. La actual profesionalización del rugby altera el patrón del deporte amateur introduciendo el dinero en la vida deportiva de los jóvenes y exponiéndolos a sectores sociales subordinados. La extensión y resignificación de la educación solidaria católica hace legítimas antiguas prácticas de caridad, subordinando la desigualdad socioeconómica en la apelación al esfuerzo y el mérito de los pobres. Los sectores de elite construyen la clase social como clase moral, estableciendo relaciones con alteridades “de clase” que les permiten subordinar el valor del dinero/capital económico como principal desigualador social y distinguirse moralmente. 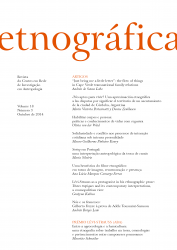 Abstract: A proposta apresentada pretende refletir sobre a hermenêutica das narrativas históricas criadas em torno dos colares de vidro da comunidade zapoteca de São Pedro Quiatoni no contexto da museologia e da antropologia. Colocados em vitrines de museus, despojados do contexto que os relaciona com as pessoas que os usaram e do significado que tiveram para elas, esses objetos tornaram-se um instrumento para recriar o passado e reconstruir o presente sob determinados ideais. São essas ressignificações que ocorrem no interior de várias instituições, validadas pelo discurso histórico, que se tratará de recuperar. O objetivo é comparar essas imagens e agências com aquelas criadas pelo antropólogo durante o trabalho etnográfico na comunidade, ressaltando os seus limites e possibilidades num contexto de conflito de interpretações.